This is my report of one of the few times I’ve been humbled. In a big way. In so many ways. I’m pleased to be part of the organizing committee of the 1st Annual Pond & Garden Tour, Waterloo Region. The best and most wonderful part of my participation is visiting and interviewing the owners of the ponds on the tour. Each and every location has grabbed me in one aspect or another. One spiritually and emotionally, one by its sheer boldness , another by not only its size and scope, but that it seems to have been in existence before the old growth forested neighbourhood was. Then I pulled up to 366 Twinflower in Waterloo, just past Northfield and Weber (admittedly a neighbourhood of single family homes including my Uncle’s where I always get lost). 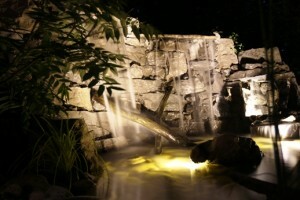 This backyard of water features, however, grabbed me wholly and unexpectedly. Why? Because it’s a family project. It’s been built, brick upon brick, stone and flagstone upon flagstone, age old wood carved and placed, year after painstaking year; all of it underscored by overwhelmingly strong family ties. It’s a true example of the love parents have for their children, and the ensuing love and respect that returns from such an upbringing. Wait. On entering the back gate, you walk through a neatly interlocked bricked side yard with BBQ and outdoor dining area, which is quite large, actually. You have no idea (yet) what awaits you around the corner. This a feast for all senses, and it can’t be rushed. Personally I felt like a kid let loose in some kind of candy land. You don’t know where to look first. You just know it’s awesome. Eyes darting in every direction, ears on high alert, yep, it’s a feast alright. All this in a small suburban backyard. So surprising. The first thing you see is a small waterfall dropping into a small pond plus a long meandering stream on the right side that finally lands into a small goldfish pond. On the exact opposite side, there’s an impressive four foot high waterfall churning into a large landing pond, flowing over a lovingly placed log, into a stream, that…wait for it….includes a working replica of an old water mill ,which then carries on over a massive mossy rock to exuberantly drop into the main pond where the koi live. 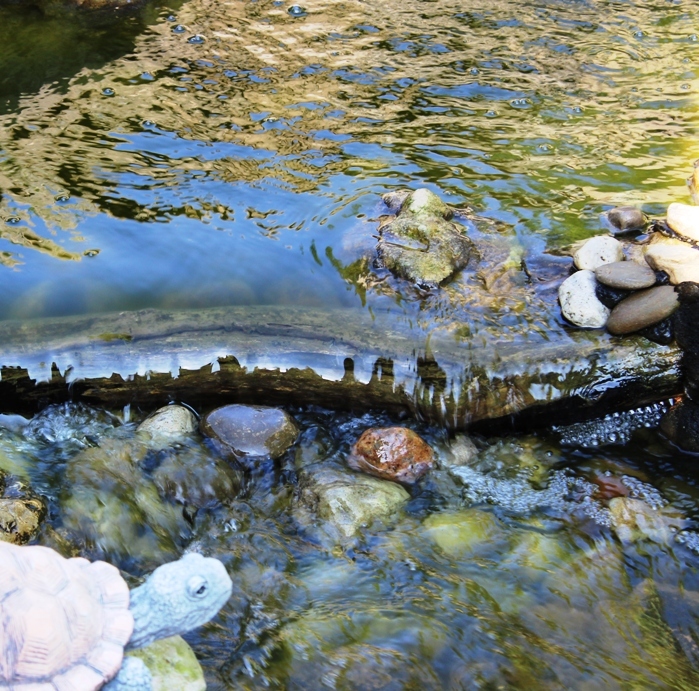 In the centre of these two water features…nevermind. Just go visit. The absolute love of water comes through in the first meeting with Mom and Dad (Deb and Rodney Erickson). They told me they used to have a trailer at Sauble Beach. With a wee water fountain into an equally wee pond. Deb’s from the East Coast. She grew up loving all things water. She not only craves the serenity and steadiness of it, she’s also a lover of ‘meandering’ and taking her time to really appreciate what she has. It didn’t take long before I found out that this wonderland was envisioned and created for her by her two sons, beginning three years ago. And it’s been an incredible journey for all of them. Kyle, her elder son (25), was the visionary. 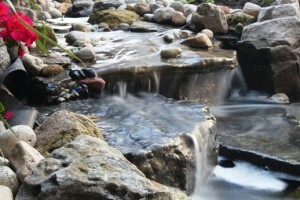 He planned and plotted and even created photo-shopped pictures of what the waterfalls, steams and ponds would look like. Wesley (21), was the backbone of the operation, the mountain. He even took courses to operate the large equipment needed to make it happen. Deb and her husband Rodney laugh, remembering. “They came to us with their ideas. We just said, okay, sounds good. 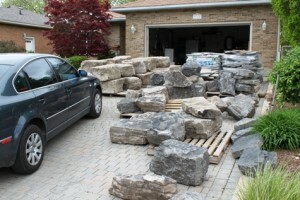 Do it.” They had no idea of the upheaval and massive rocks that were to define their driveway and backyard. Rodney became as he admits, the willing labourer in their vision. “I just did whatever they told me to do.” As it turned out, that was a lot of heavy labour. 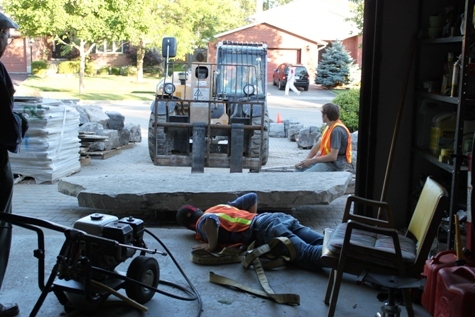 From the patio stones out the back sliding doors, to the flagstone carved into pathways, and incredibly, the 3,000 pound rock that became the main seating and feeding area of the pond. It instantly became a labour of love. A labour shared by family. Connected by that original vision. Who knows when it will actually and finally be decided its ‘completed’? Besides, the boys kept secrets. They have a workshop in the basement, where they know their Mom never goes. Ever. 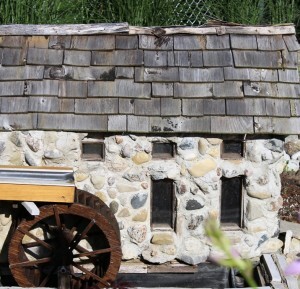 To surprise her they meticulously built, to scale, a historic local water mill — a replica of Abraham Erb’s (the first settler in Waterloo) grist mill from 1816– that actually operates functionally into the stream that flows into the main pond. Their sister Laurissa helped by attaching the stones, staining the roof, taking sequential pictures and assembling the wheel. And get this, she was in charge of waking her brothers up for shifts throughout the night to finish it on time for Deb’s retirement. 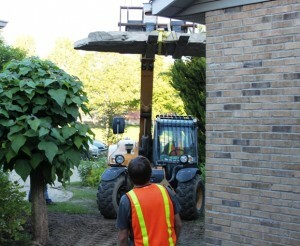 Weighing in at 500 pounds, no less, it was no easy feat bringing it up from the basement. If that wasn’t enough, Deb’s Dad also built a working replica lighthouse from the East Coast from Deb’s childhood. 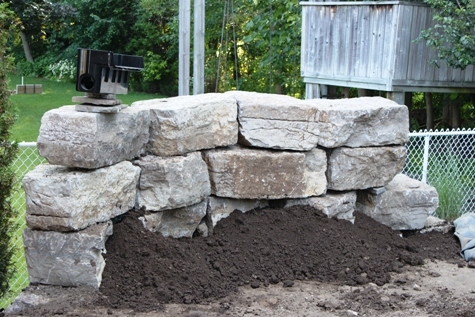 Every single aspect of this backyard retreat was carefully planned, heaved and carved- old downed logs, rock, and flagstone–to precisely exact a landscape that would provide their mom with memories of not just her childhood, but theirs as well.